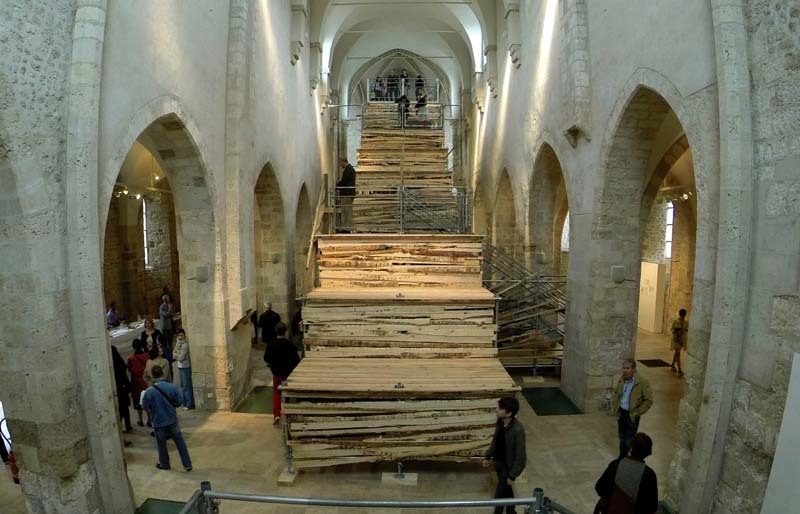 Inspired by the half-timbered houses and architecture of Orleans, France, French artist Sambre (previously here) whose signature style involves using recovered wood in a variety of impressive installations, is in the process of building his latest work titled Escalier de Secours (Fire Escape in English) in the center of the Church of St. Peter the Puellier in Mairie d’Orleans. The exhibit officially opened at the end of May, though the enormous staircase was not yet completed, this completely intentional, inviting guests to experience the process. Sambre’s majestic and almost disproportionately large staircase offers discovery through ascension; new perspectives on the Church’s space and architecture. The artist doesn’t impose a single path, but invites visitors to make a choice among multiple possible routes, like the path of life chosen by man. 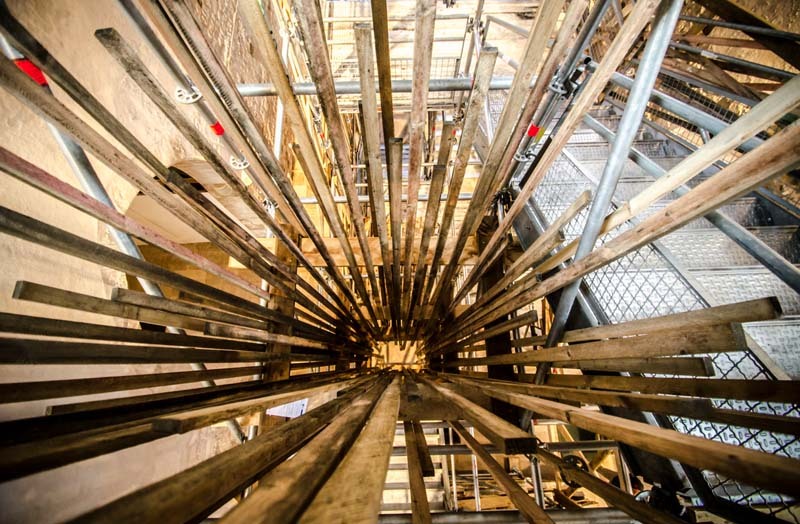 It is also an invitation to come see, hear, and touch the work that is being built. This intervention comes only two months after his last piece along the Seine in Paris (see bottom two photos), once again utilizing discarded materials instead of spray paint to create his sculptural street art. And shortly before that piece, he collaborated with Teurk and Run on OKube (see two photos on middle right side) for the Inuit Festival in Cergy. So far, 2014 has been a very prolific year. I look forward to seeing what he comes up with this second half. Escalier de Secours will be up through July 13, 2014, if you happen to be in France this summer… lucky you.